Brazil has long been on my mental “bucket list” of places to visit. Not only is it one of the world’s largest countries both geographically and by population — fifth on both counts — but it’s also the center of attention right now because they are hosting 2014 World Cup and the 2016 Summer Olympics. Add in a Carnival or two and you’ve got quite a party! Brazil also fascinates me because it contains the Amazon rainforest and is home to the planet’s greatest biological diversity. One in ten known species in the world lives in the Amazon, by far the largest collection anywhere. Speaking of diversity, from a sociological perspective Brazil is equally manifold; it’s home to a unique blend of so many European and African cultures that it almost reminds me of the United States. Anyway, recently a two-week trip came up that allowed me to cross this one off my list in the best way possible: on the company dime. 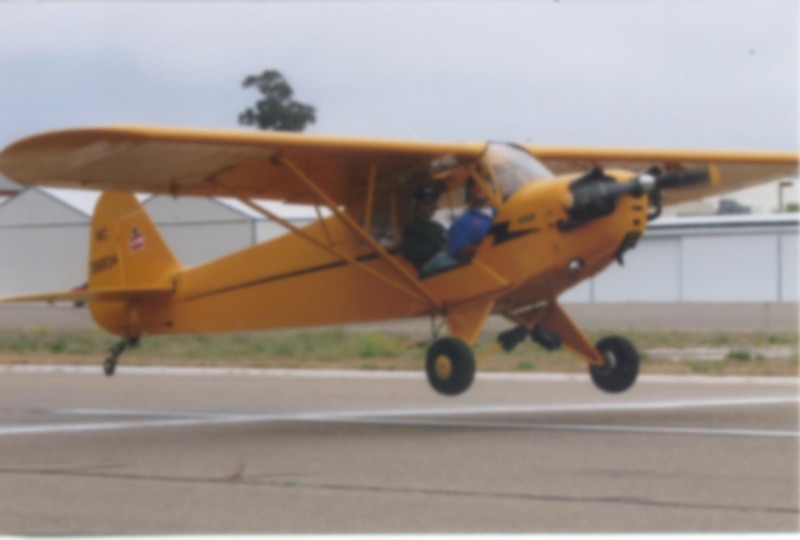 The trip originated in Los Angeles with a day of flying to Santa Barbara, Vermont, and then New York. The east coast has been having some spectacular fall weather which we were able to enjoy for a few days before departing at about 9:00 p.m. on an overnight flight to São Paulo. 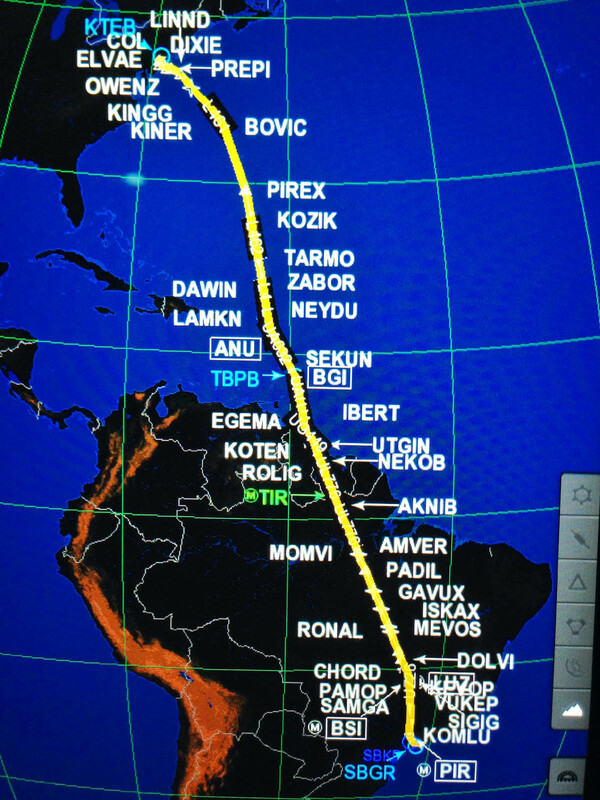 Our route of flight from New York to Sao Paulo, Brazil. This was a maxed-out night of flying, as the Part 135 rules which govern on-demand charter only allow for ten hours of flight and fourteen hours of duty time per day. The straight-line distance is about 4,800 miles, just beyond the Gulfstream IV’s non-stop range, so we alighted in the Lesser Antilles island of Barbados after about four and a half hours for a splash (aka several thousand gallons) of kerosene before proceeding on a five hour leg to the Brazilian capital. The second leg took us past Guyana and over the Amazon rainforest which, while it was teeming with life, was also one of the darkest places I’ve ever traveled. Even with a partial moon, from 45,000 feet the Amazon was like an earth-borne black hole, inky in every direction. I wasn’t just the absence of man-made lighting, because I witnessed far more luminosity from the open waters of the Atlantic Ocean. Here, the sky was a much lighter shade of sable than the earth. My thoughts went back to N87V, a U-21G which disappeared with three aboard during a uranium survey mission over the dense jungle of western Guyana back when I worked for Dynamic Aviation. Despite spending years and millions of dollars on search efforts, as far as I know the aircraft was never located. The jungle is like that. The forest canopy is so dense that it can swallow an aircraft, leaving no visual trace for searchers or satellites to pick up on. The foliage has a matte-like surface, so it makes sense that at night this same vegetation would absorb light. I can’t even imagine how dark it must be underneath the canopy. Note the “IRS 1” lattitude of exactly zero degrees. 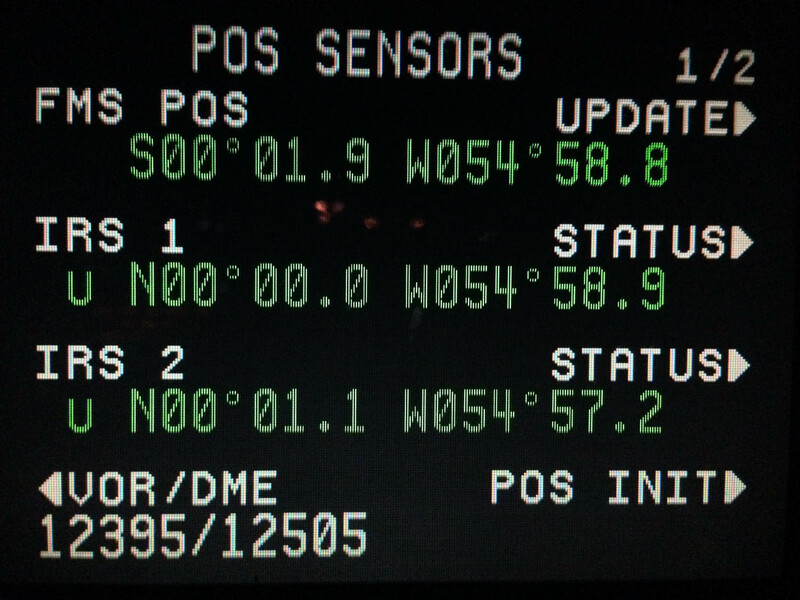 It means we’re directly over the equator. 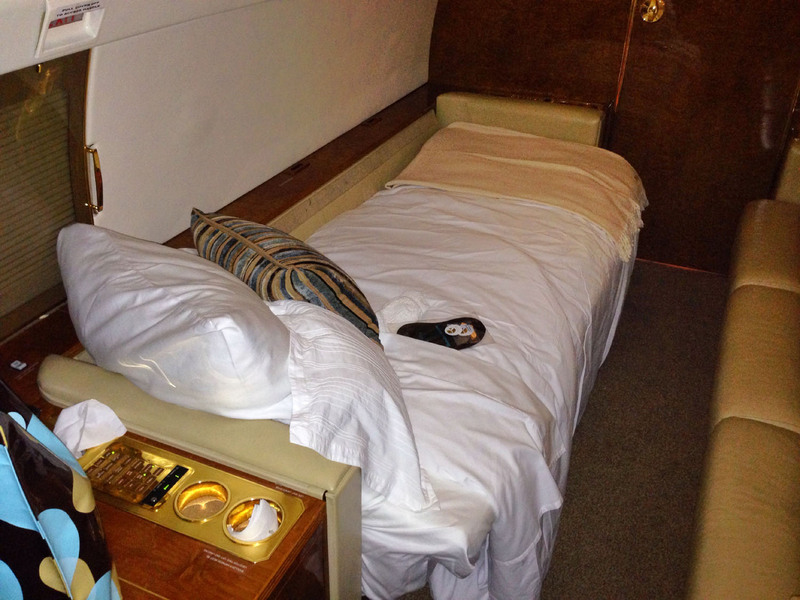 Despite the Gulfstream’s many creature comforts, overnighters are tough. I tried my best to get on a sleep-all-day/up-all-night schedule in the days leading up to the Brazil trip, but it’s easier said than done. 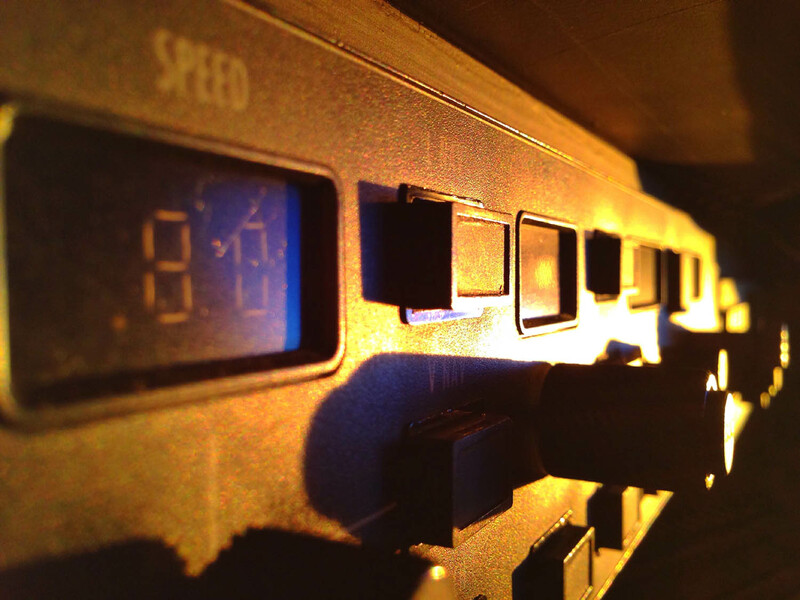 Altering one’s circadian rhythms so drastically over just three days when you’re already several time zones away from home… well, it’s not impossible, but circumstances do tend to conspire against you. Room service knocking on the door, hotel maintenance, an occasional incoming phone call, invitations from the rest of the crew to grab a bite, etc. I pride myself on being able to sleep just about anywhere, but there’s always something keeping you on the front side of the clock. That’s the long way of saying we were a bit bleary-eyed when the sun came up just prior to starting our descent into São Paulo. What first captured my attention was the sight of the city itself. I’m not sure how to describe it except to say that from 15,000 feet up, skyscrapers stretched as far as the eye could see in every direction. There was no central “downtown” as you’d expect with most American cities — everywhere was downtown. 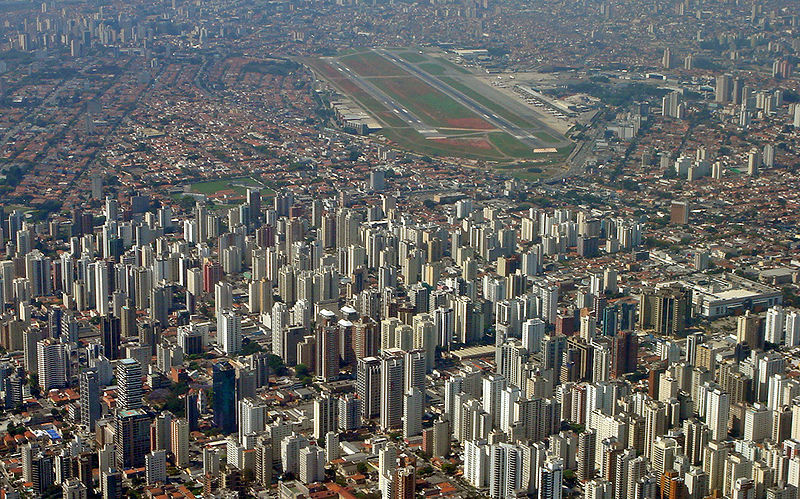 The pilot I was flying with exclaimed, “I used to fly into Mexico City all the time and this place makes it look like a quaint little fishing village!” The official population of São Paulo is 12 million, but to my eyes that figure looked severely understated. Congonhas Airport is at the top of the photo. We departed this airport enroute to Salvador de Bahia in northern Brazil. São Paulo makes Mexico City look like a tiny village. One element of the trip which was not surprising? The red tape associated with flying internationally. They have it in spades down there. After landing at Guarulhos Airport, I spied our hotel not a quarter of a mile away. Ah, sleep! Could it be true, I thought? No, it couldn’t. Our handler did her best to expedite us through the maze of airport roadways and paperwork, but it was still two hours before we collected our room keys. The driver who shuttled us to the hotel spoke of the incredible cuisine available “in town”. I thought we were already in town! We inquired about how long it would take to get there and was told “two hours — three if there’s traffic”. It was just as well, I suppose; we’d be sleeping much of the day anyway and were scheduled to pick up passengers at São Paulo’s Congonhas Airport very early the following morning for a 900 mile leg to the Bahian capital of Salvador. The flight guidance panel. Our Mach .80 speed seems rather dowdy compared with the .90 of the new Gulfstream G650, but on an average leg the difference isn’t all that great. Salvador de Bahia is one of the oldest cities in the Americas and second only to Rio de Janero as a tourist destination. As a former colonial capital, it’s the spot where the confluence of African and Portuguese cultures is most apparent. We spent four days there at the Pestana Bahia Resort. It wouldn’t win many platitudes from travelers used to the comforts of high-end European or American accomodations, but it did the job and is apparently one of the nicer hotels in town. My room overlooked the rocky coastline where the wind was strong and constant. There were few English speakers in Salvador, so we had a chance to practice our rudimentary Portuguese. I probably insulted more people than anything else with my lousy vocabulary, but it’s been my experience that locals at least appreciate the effort. The coast is this area is prone to strong wind and surf. Not that I’m complaining; it sounded great and sure kept the air clear! We were warned by the hotel not to venture outside at night on our own, and from seeing the town during the day I can understand why. 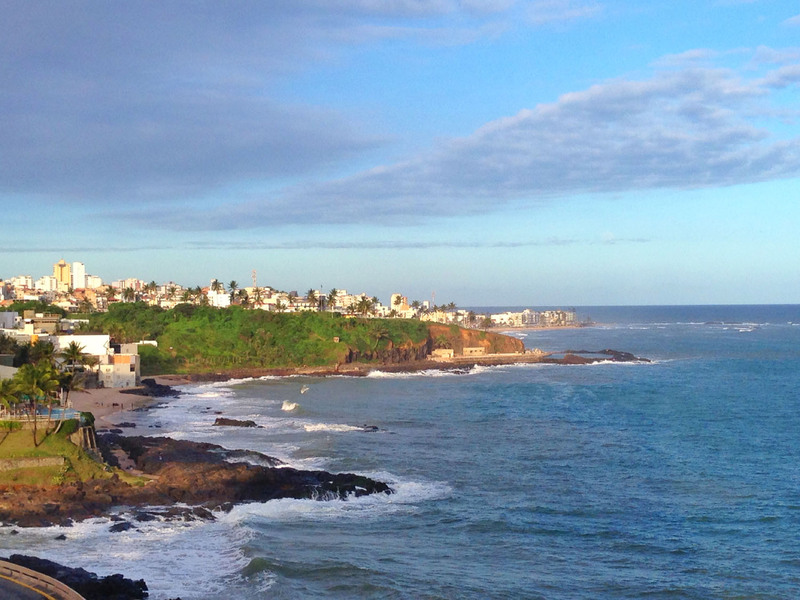 Salvador is two cities in one. The southernmost portion is a modern business and financial hub teeming with glass skyscrapers, while the old town area is filled with the sort of colorful and historic colonial architecture you see throughout the Caribbean. Likewise the social and economic fortunes of the residents, where significant portions of the city are overcrowded slums while other sections are beautifully manicured — and gated. Even the geography diverges; the downtown area sits on a different elevation than the rest of the old city, so an elevator was built to connect the two segments. It doesn’t seem terribly noteworthy until you discover that the Lacerda Elevator was constructed by Jesuit missionaries in 1610. As you might imagine, that first iteration was a bit short on creature comforts. It was operated via a manual rope-and-pulley arrangement. The conveyance was converted to a mechanical steam system around 1868 and then finally to electricity in 1928 (which explains the present art deco style). Imagine — this elevator has been in nearly continual operation for more than 400 years. Top that, Otis! As an admitted foodie, my best memory of Salvador has to be the grub, especially a traditional Bahian meal we had at a local restaurant called Cafe de Tereza. Our main dish was moqueca, a seafood stew made with dende and coconut milk. They love coconuts down there — in fact it was far easier to find coconut water than the plain stuff. Our hotel put out rows of raw coconuts every day in the lobby, sliced open with a little straw and some fruit hanging off the top. The big adjustment from a culinary standpoint was getting used to the palm oil they use in most of their cooking. In the U.S., our staple is olive oil, but in South America the more plentiful palm oil is utilized. There’s nothing wrong with that, but food seemed to sit “heavier” in my stomach and made me feel fuller for a longer period. 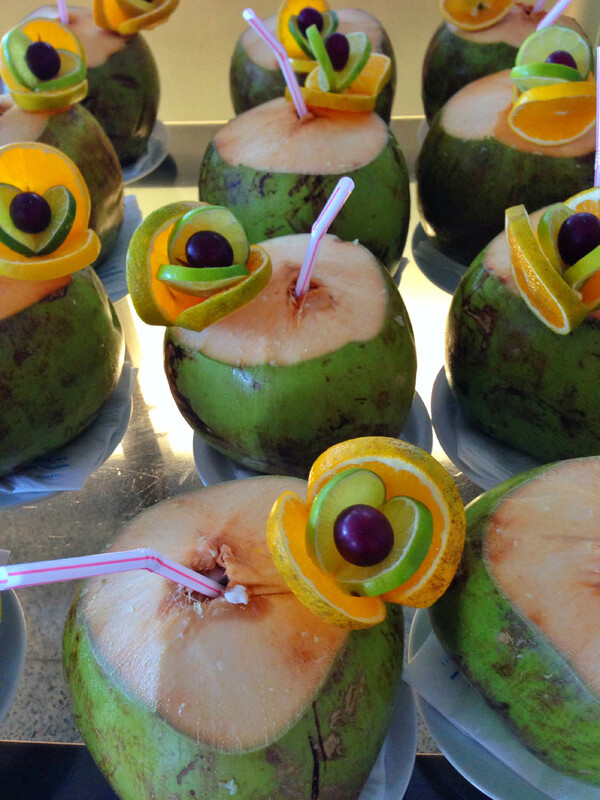 Vitamin water, Brazilian style: straight from the coconut. Though it wasn’t always served this way, coconut water seemed to be available everywhere. Speaking of drinking, the caipirinha is Brazil’s national cocktail and one of my personal favorites. It’s akin to a South American mohito, except it’s made with cachaça, a rum-like spirit that’s made from fresh sugarcane juice rather than molasses. On our last night in town, the staff at the FBO took us out to dinner and I was introduced to the caipiroksa, a variant crafted with vodka. The suggestion was to try it muddled with fresh strawberries. Delicious! The following evening we geared up for another overnight flight — the return trip to Gotham — while the lucky passengers slept soundly in the back. The Gulfstream’s cabin is more than 41 feet long, so with only two guests, each was able to have their own generously-sized space. Not a bad way to travel if you’ve got a few extra bucks for the privilege! The trips to and from Brazil were overnight flights. Our passengers slept comfortably in the Gulfstream while we kept the watch up front. The only oddity on our trip was the early descent given by New York Center as we approached the U.S. coast. We were enjoying a gorgeous sunrise — or rather, I was enjoying it from the shade of the left seat as my compatriot suffered with a steadily intensifying reddish-yellow sun creeping into the sky on his side of the aircraft because this bird was not equipped with the retractable, dark film window shades found on most Gulfstreams. Anyway, the radio crackled with a call for us to begin a descent. As I recall they had us down to 15,000 feet more than 200 miles from our destination. Premature descent clearances are nothing new for that part of the country, but this was comical even by those standards. Jets don’t like to fly low. Actually that’s not quite accurate. They have no problem being at that altitude, but it’s extremely inefficient from a fuel consumption standpoint. We spent the last hundred miles droning along at about 3,000 feet, thankful for having a generous fuel reserve. Those red-eyes can be painfully long. 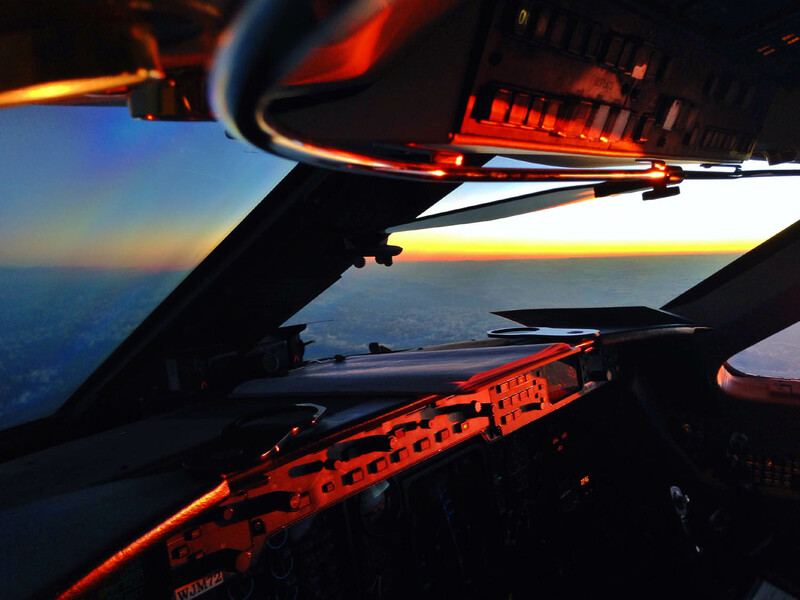 It’s always worth it when a beautiful sunrise casts that reddish glow across the cockpit. This was an enjoyable trip in every respect: a fun crew, new destinations to explore, a lightly loaded aircraft, and plenty of time in between legs to rest up. Much like California, Brazil’s a place you could spend the rest of your life exploring without seeing everything. With all that’s going on there these days, I have a feeling it won’t be long before I’m saying “OLÁ” once again. Nice story Ron! I have never been south of the equator in all my travels so Brazil would be a huge treat. Seems like there is a lot of flying going that direction these days, so maybe some day I’ll make it down. Glad you enjoyed it Brent. I saw several N-registered Falcons down there and thought of you. This was only my second trip to South America, so it definitely felt like a new experience. Hope you get the opportunity to see what South America has to offer! I knew it felt familiar for a reason! All we were missing was the Agnav light bar on the glareshield. Glad you enjoyed the post! How is Gol? Or Azul? You guys seriously have the coolest jobs in the world. Hi Marcelo! Yeah, it’s too bad we weren’t able to connect while I was down there, but I understand your city in pretty far from Salvador, and we were only Sao Paulo for a day. Events like the Olympics and World Cup are a good reason to improve infrastructure, so hopefully the airspace system (and economy) will see some improvements. I loved your comparison between flying in Brazil and driving a Ferrari off-road! Sorry to hear about the airline situation, but there is a bright side: if there has to be bankruptcy and consolidation, better that it happens before you get too deep into the seniority ranks because the higher you go, the more you tend to lose when the pilot ranks are merged. You’re more than welcome to share the article with anyone you like! The more the merrier. Great article and pictures. Can you put the pictures in the email instead of having to go to the comment section to see them? Hi Glen. If you’re a subscriber, the photos are embedded in the e-mail. If you’re not seeing them, it might be because your e-mail client is set to show messages as “plain text” instead of HTML. Wow, you have an amazing job. Great story on your trip to Brazil, Ron. I really enjoyed it, as always. It was great to see you at the SCAA event a few months ago. Hope our paths cross again soon. Thanks, Daniel! I was delighted to run into you in Carlsbad — and not just because you were the only one there that I knew. 🙂 Let’s arrange a lunch and catch up; I’d love to hear what you’ve been up to! I always enjoy checking in on your blog to see what you’re up to. Thanks for the great story! Ben! Great to hear from you. Thanks for the kind words about the post. What’re you up to these days?